Managing multiple web presences so that they all 'feel' like one seamless interface is not an easy task. Ben Ridout, Digital Services Manager at the Albuequerque/Bernalillo County Public Library, is in charge of creating a cohesive virtual library experience. Not an easy task especially when you factor in that the the ABQ-BERNCO Library consists of 18 branches. Interestingly, Ben's job is made easier by making use of the Springshare Platform. Using LibGuides CMS to power their website, they created a custom banner and footer. Adding a Google Translate widget to the Header allows them to satisfy their diverse population with multi-lingual translation options. This banner and footer was then easily applied to their public LibCal and LibAnswers systems. So while users are interacting with three separate websites, the entire user experience is virtually seamless. if they're not looking right at the URL field in their browser, they probably don't even know that they jumped between websites. While the ABQ-BERNCO Library consist of 18 branches that service both the town of Albuquerque and the county of Bernalillo, Ben emphasizes the library as a holistic organization. Using Springshare's Platform of tools, it makes it easier for Ben to emphasize the ABQ-BERNCO Library's unified presence while giving each individual branch library its autonomy. We don't think of each branch as singular. We 'go plural'. We keep the Library as a 'We'. There are 18 public LibCal calendars, one for each of the 18 library branches. Since 2012, they've used LibCal to advertise and manage more than 25,000 events. 2016 alone saw 5,319 events, a significant increase over 2015. Each individual branch autonomously creates and publishes their own library events. Using widgets, Ben is able to showcase all the upcoming library events, across all 18 separate branches, right on their LibGuides CMS powered Website. 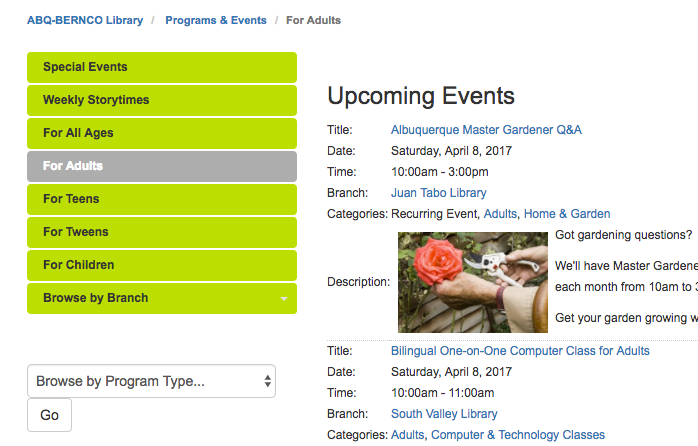 Essentially, each branch's events feed into the Library Homepage and provide content for the entire ABQ-BERNCO Library Community. In my department of two, we don't have to be the sole people posting all the events across all the branches. Because with our volume, that would be next to impossible. Using LibCal widgets, Ben's able to ensure that the ABQ-BERNCO Library whole is greater than the sum of its parts. But it doesn't end there, using LibCal categories, each Branch Library is able to tag each event with metadata such as intended age group, subject matter, and branch. These categories auto-update several strategically placed LibCal widgets so patrons can search for events that best meet their needs. Once the structure was setup, the widgets automatically update every time a new event is published matches those category tags. And best of all, Ben doesn't have to do anything! 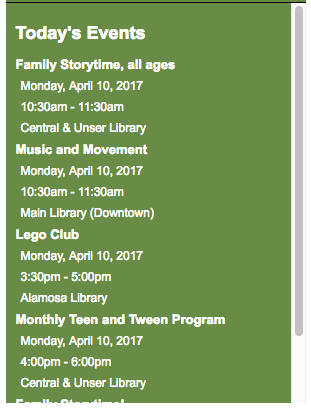 The ABQ-BERNCO Library Website, powered by LibGuides CMS, gets thousands of hits a day. The first 3-months of 2017 saw more than 360,000 hits to their homepage. That's a lot of traffic and Ben needs to ensure that new and relevant content is constantly posted. But how do you manage that across 18 branches? Each individual branch gets their own LibGuide-as-Homepage and Ben has worked out an ingenious way to ensure that each branch homepage gets updated consistently. IT Controlled Content - The centralized tabbed box is controlled by Ben's central IT department. 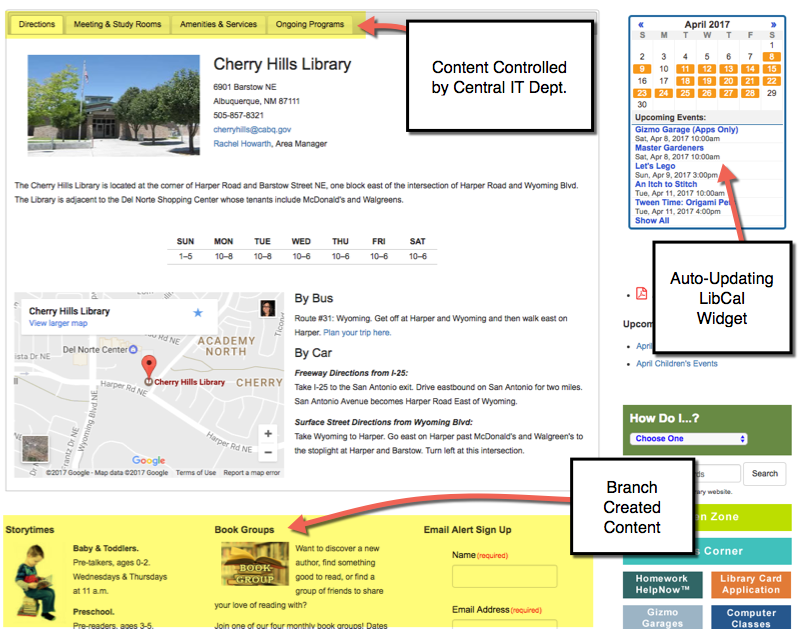 This helps to ensure a consistent look & feel of content across branches. 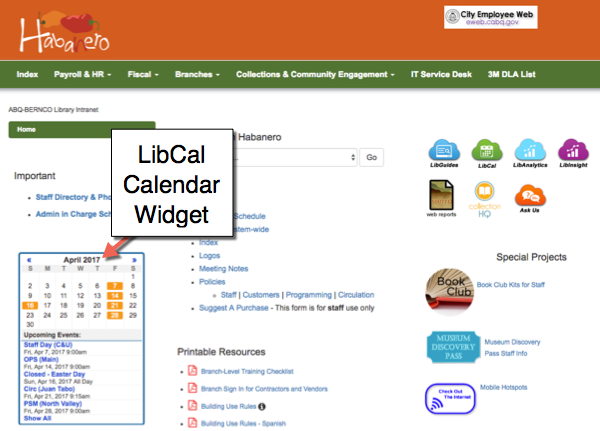 LibCal Calendar Widget - Each branch library homepage has a LibCal calendar widget showcasing their specific events. Branch-Specific Updates - One section of the homepage is controlled by the branch. This way, branches can get the freedom to play and do on-the-fly updates to their homepage when they want to without interfering with the standardized content. Sharing internal documentation across the entire Library, especially when staffers tend to float between branches, can be a difficult project to manage. 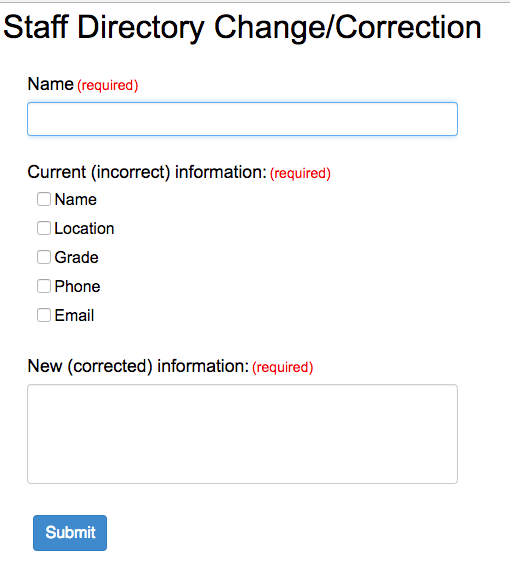 Using LibGuides CMS Restricted Groups, Ben has created a cloud-based mobile-first staff intranet called Habenero. Using the same interface as the website, staff can seamlessly jump over to their IP-protected intranet to get detailed information on policies, staff directories, and more. Plus, Ben embedded a LibCal private Staff Calendar showcasing internal library meetings across all departments and branches. Habenero works great for our large volume of staffers across 18 branches that tend to have a lot of staff moving between branches. Gathering data from across 18 separate branches can be a difficult task. Ben streamlines the process using a combination of LibWizard and LibInsight tools. With LibWizard, Ben embeds forms on both their public website and Habenero staff intranet. This way, feedback from patrons and fellow staffers feeds straight to his inbox. Compiling library stats for the city government was a cumbersome monthly task. Previously, each branch library would add their stats to an Excel spreadsheet. Frequently, formulas in the spreadsheet would break if branch libraries tried to add new rows or columns. This got to be very frustrating after awhile. Each branch library now submits their monthly data to a designated LibInsight dataset. From these datasets, Ben can create dashboards and run robust reports for sending to local government departments. When asked why the ABQ-BERNCO Library uses the entire Springshare Platform of tools, Ben replied with, "Why not? They're easy and they make my job easier". With V2's integration, why would I want to go for an outside solution of a different product when it's already tied together and goes together smoothly. It's easy for our accounting dept, getting one invoice through city purchasing. And then, I've got toys to play with that are easy. Plus, I can do extensive training with folks who want to do a lot of stuff with the tools or minimal training with staffers who just want to post events.